Chank Gemini Type Fontpack - Chank Fonts! Chank Co is proud to introduce the new “Chank Gemini Fontpack,” a collection of ten fonts available for use on your desktop computer or web pages, but also optimized for use as exterior cast-metal signage in bronze or aluminum in collaboration with Gemini, a family-owned wholesale manufacturer of dimensional letters, logos and plaques based in Cannon Falls, MN. Gemini collaborated with Chank Co to assemble a line of fonts that would work well as dimensional, cast-letter signage for use on the sides of buildings, in stores, and other public spaces. A multi-purpose line of heavy-lifting fonts to convey your message strong and clearly, full of legibility and clarity, but also displaying personality and distinction. 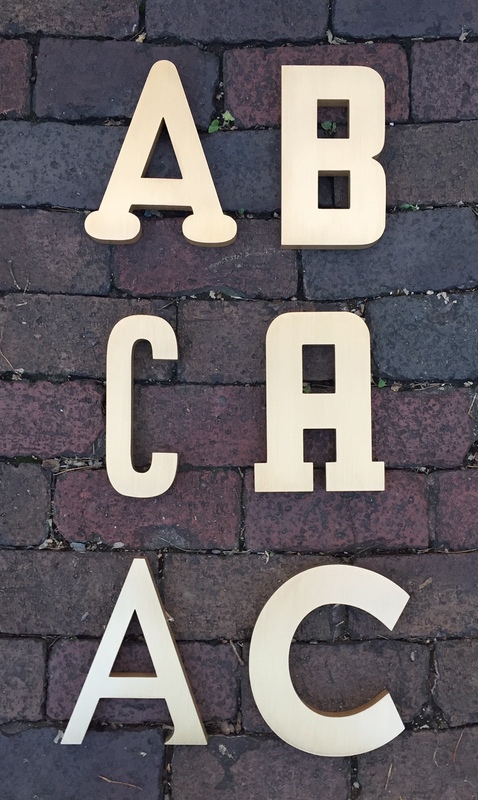 And now these exclusive typefaces are also available as dimensional letters, manufactured by Gemini in bronze or aluminum, from 6" tall up to 18" tall, with a variety of finish options, for use in public signage and wayfinding systems. Gemini manufacture their products in 20 plants through out the US, Canada and Mexico, and all their products are backed by a lifetime guarantee. 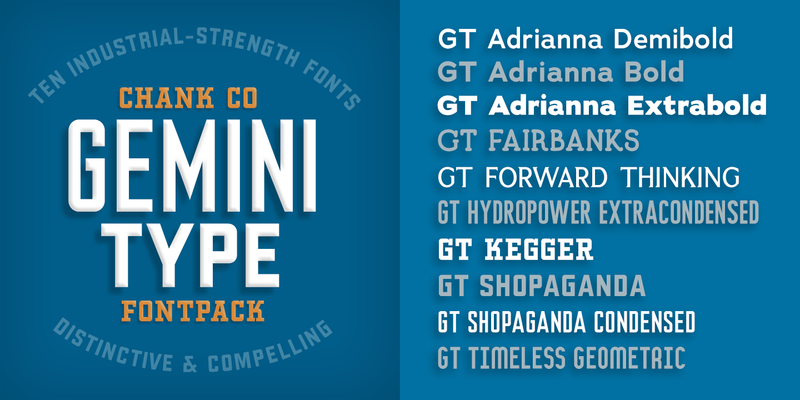 Chank Co is excited to offer these ten strong, industrial font designs in durable cast metal format via Gemini. You can purchase and download these fonts in OpenType format for your desktop computer via this page at MyFonts. Get it today and you’ll also get a great introductory special sale price. Clear, invisible, no-nonsense, multi-purpose. A versatile sans-serif heavy-lifting font family. Futuristic, semi-serif, clean, distinctive, contemporary, idiosyncratic. A font for tomorrow and the future. Extra-condensed, compressed, strong, rigid and concise. Strong, sporty, collegiate, athletic. Nothing says “GO TEAM” quite like a big, bold slab-serif font. Industrial, geometric, constructivist, propaganda, oh there’s so much to love about the strength and clarity of these two fonts. Based on Chank’s Liquorstore and Nicotine fonts, which have been married and unified here, with a few new twists and turns to their letterforms. Bauhaus, anyone? The geometric and minimalist alphabet here is about as clean and straight-forward as a semi-condensed sans can get. All of the fonts in this package are available individually, or save money when you purchase all ten of them as a collection. If you’d like to use these font designs for exterior, architectural purposes, visit the Gemini website to learn more about how you can get them in metal-letter format from a signage retailer near you. Download this font from MyFonts today and you’ll receive both OpenType and TrueType formats in your download for your desktop computer. Webfont format is also available.